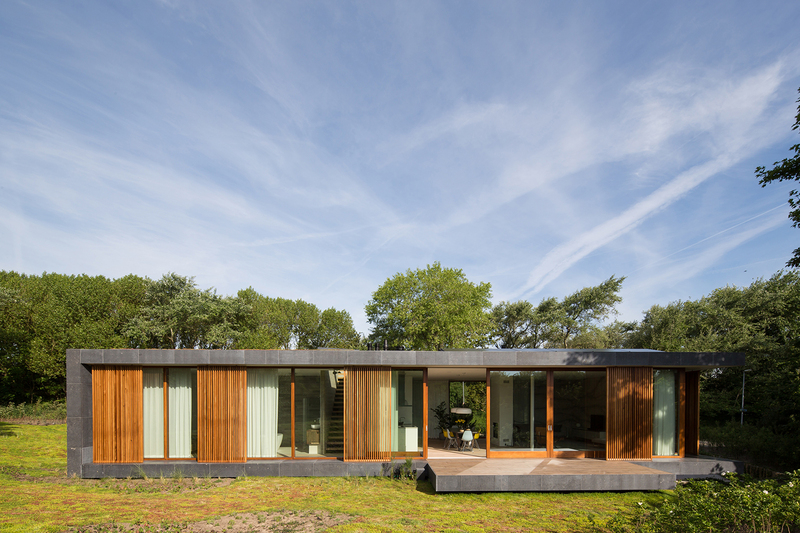 BERG + KLEIN designed a loft in the landscape in the dunes of the Hoek van Holland, Rotterdam, the Netherlands. The basic idea of Villa H was to have an open floor plan, a view and limited but very specific spaces. In the discussions with the client in the beginning of the design process it became clear that he had true ambitions to create architecture but on a scale that fits him personally. BERG + KLEIN and their client talked about architecture and design with references coming from Chili, Mexico, Brasil. 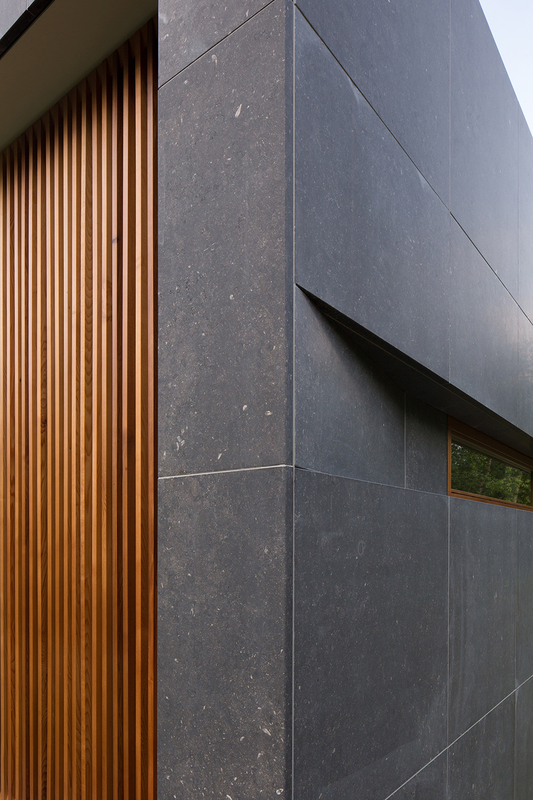 To combine concrete, wood and natural stone in a beautiful landscape guided the design from the onset. 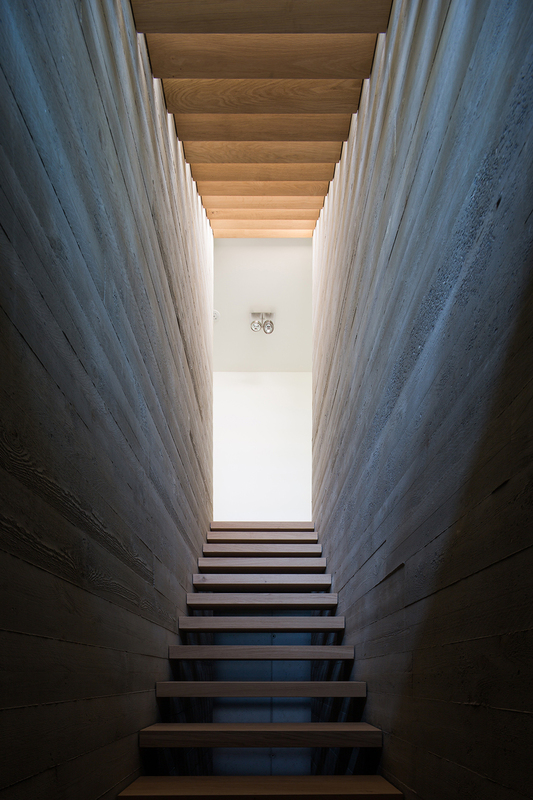 Villa H is a horizontal design with one vertical element, a staircase in between two concrete walls that links the sous-terrain, the bel etage and the rooftop terrace. The villa is, as a befriended architect once said: ‘a restrained design’. The dedication in the design has been on the composition and exact dimension of tailor-made spaces; the terrace in the garden with a long view to the dune forest, a living room with a fireplace, the entrance as classic vestibule. 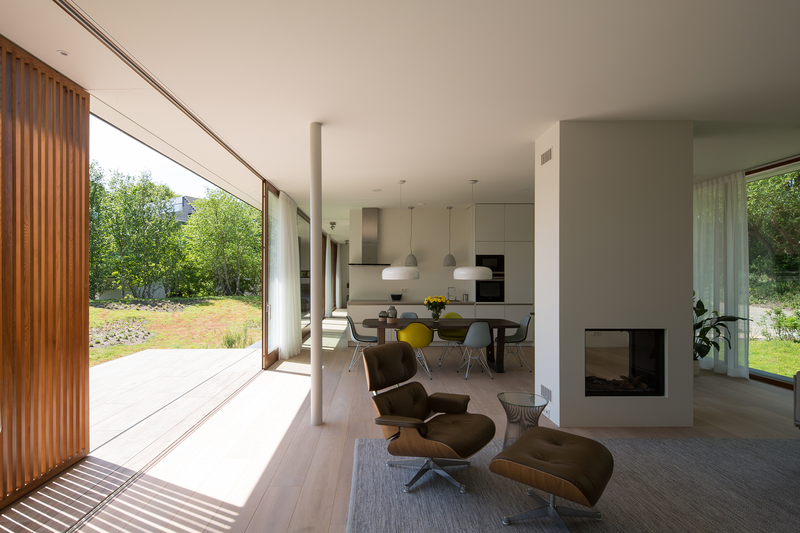 Important for the design are the cantilevered edges of the house that give it a horizontal articulation and that frame the landscape between the floor and the ceiling when you look from the inside out. The construction of the house is an essential part of building a house, of course. The client had a background in building engineering and overlooked the construction personally. Being on site everyday to see how the concrete was being moulded or how the wooden mullions were positioned. This has been a very important element in the precise construction of the villa. A lot of personal dedication has been involved and that has an effect on everyone involved in the construction. 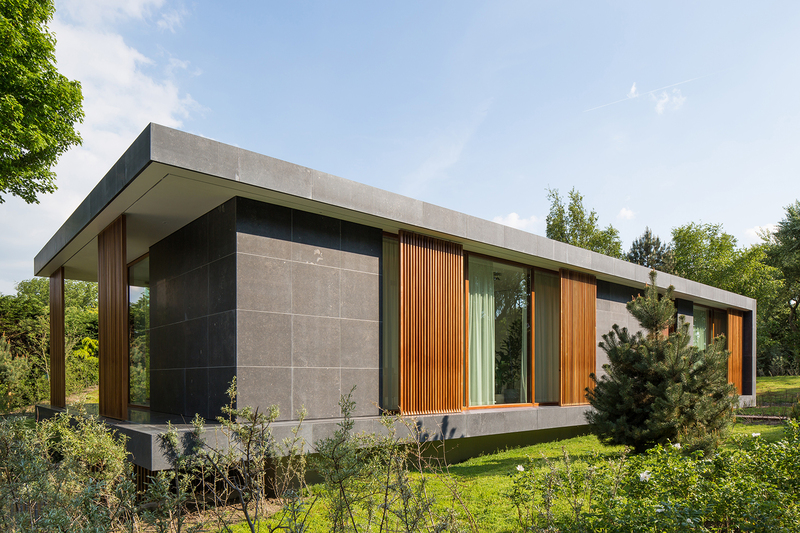 The construction of the house is 80% concrete moulded on site. The walls of the sous-terrain and the vertical walls at both sides of the staircase are exposed concrete. To have the best possible result of concrete moulding for the nine meters high bearing walls, a horizontal wooden mould was made on site. The walls were moulded horizontally and later, with the use of two cranes, placed in the centre of the house. 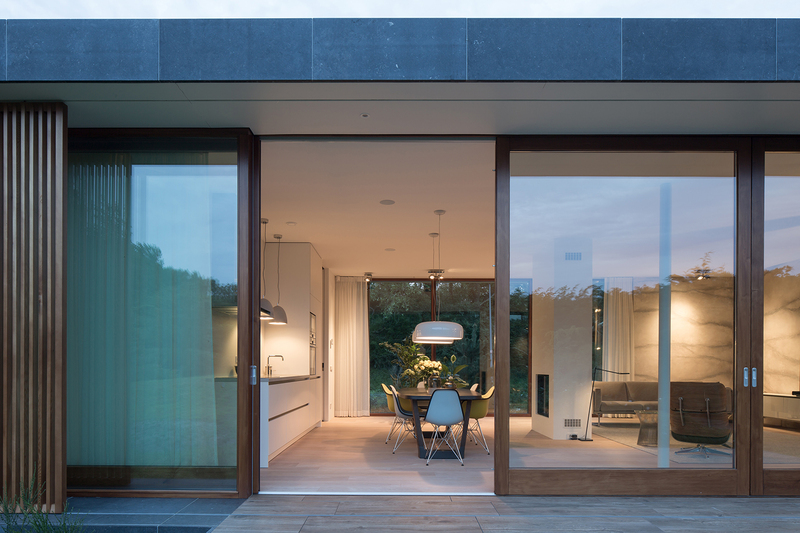 The design is a ‘glass-house’ typology with an open facade to the garden. 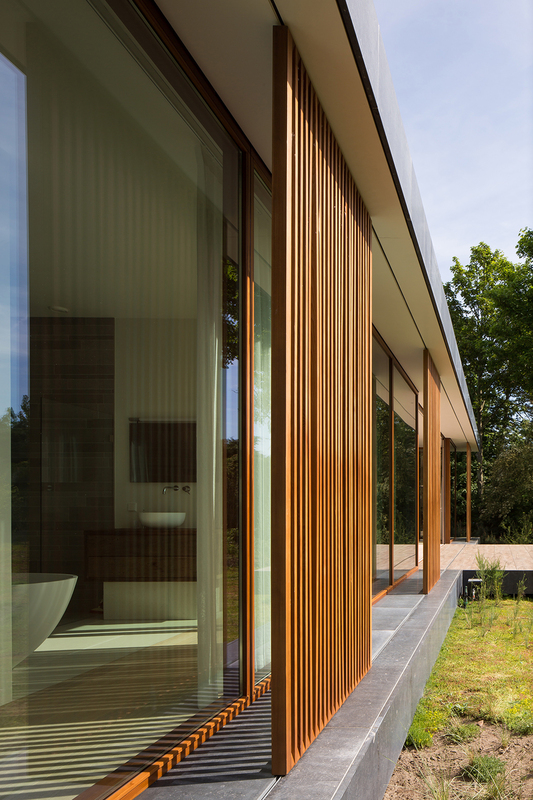 The architects and the client decided to have large scale wooden mullions. It gives a strong material and warm atmosphere. The mullions are made from stained Western Red Cedar. The scale of the frames is in most cases 2 meter 30 wide and 3 meter high. At the terrace, that is positioned to have the longest possible view to the forest nearby, three of these mullions can slide open. 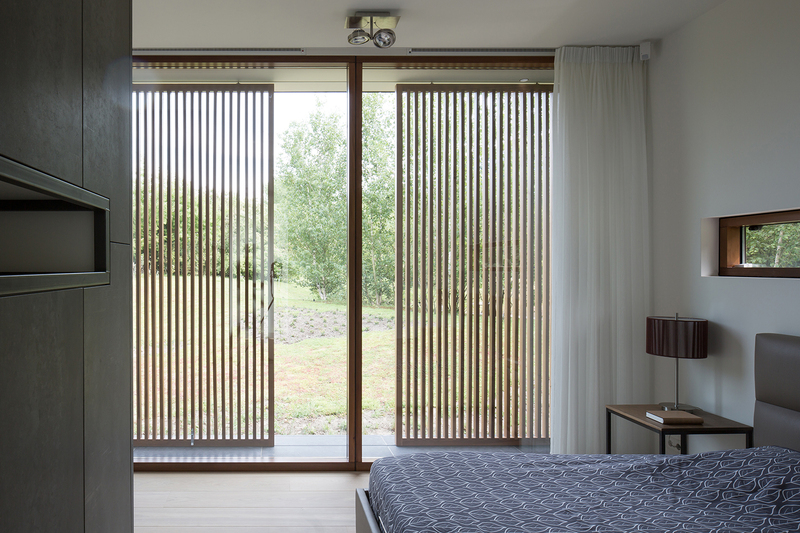 This creates an opening of almost 7 meter that blends the inside of the house with the garden in summer. 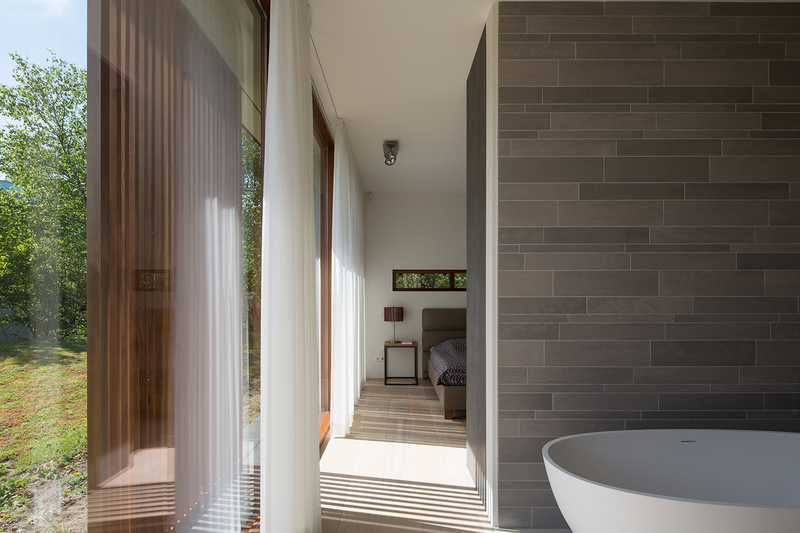 Wooden Brise-soleils that can slide along the entire perimeter of the house in between the cantilevered roof and floor provide shade were needed most and provide privacy to the open bath room and bedroom. 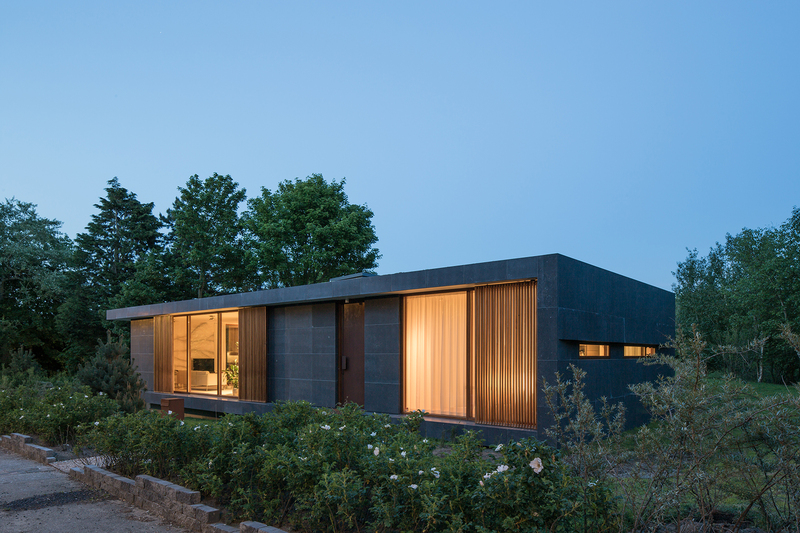 The house makes use of sustainable infrastructure with full natural ventilation, a roof with vegetation and solar cells and an air-driven heat pump. The architects worked closely together with the client on the interior design. The aim was to create an open and warm interior, tailor made for the client. His own ideas about the interior and the selection of furniture were very much inspired by the design process of the Villa. 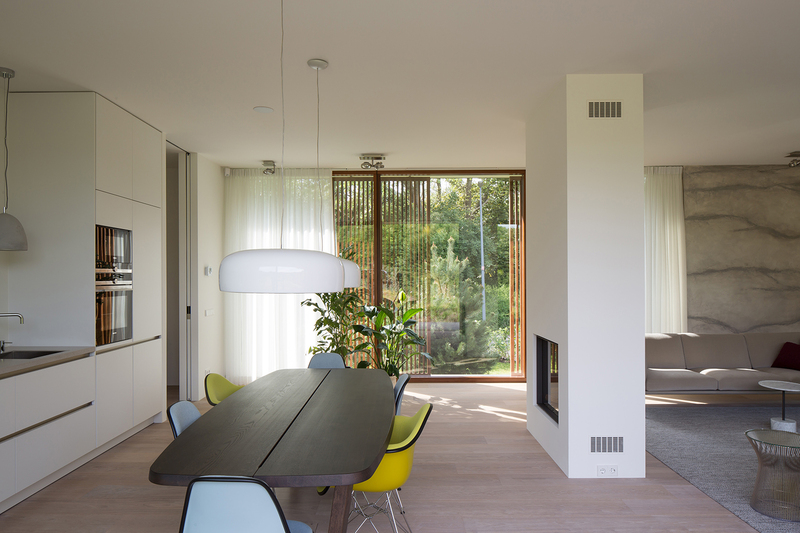 The furniture selection in Villa H includes among others Cassina, Vitra and Flos with Eames and Rietveld chairs.